“Our community website was developed by the Viera East Golf Course District Association, Inc. (VEGCDA) to serve as an informative resource for both our neighborhood and our local community. The use of the VEGCDA website is governed by our 'Terms and Conditions of Use Policy.' Please take a few minutes to review our Use Policy Statement. CLICK HERE to review. Please feel free to contact us with your comments and suggestions for improving our website." The Viera East Golf Course District Association is a golf course community of 719 homes located within 12 named communities. The master plan was developed by the Duda family and later transferred to the residents of the Viera East Golf Course District Association (VEGCDA) by Florida statute. Viera is a Slovak word meaning "faith". It was chosen by the Duda family for our beautiful community because it embodied the family's heritage and evoked visions of the future. VEGCDA has a Residents' Clubhouse with an Administration office, large meeting room, card room, exercise area, and swimming pool. Our well-maintained Sports Complex has two tennis courts (one of which has pickleball markings), shuffleboard, bocce ball courts and ladder golf. The Viera East Golf Club is an 18-hole championship golf course designed by Joe Lee. It is an attractive, stimulating and above all, immensely playable course for the average golf enthusiast. 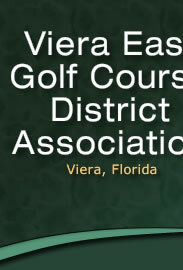 The Viera East Golf Course is a PUBLIC golf course, operated and maintained by the Community Development District (CDD). The course features lush, rolling fairways, crystal clear lakes, spectacular white sand bunkers and swaying palm trees. The natural wildlife corridors of Viera East are home to a host of wildlife including American bald eagles, sandhill cranes, spoonbills, alligators, foxes and bobcats. New TifEagle Greens and EZGO golf carts with GPS are ready for play! As part of the golf course complex, Divots Grille offers a full menu breakfast, made to order, as well as fine foods for lunch, at affordable prices. Grille hours are from 8:00 a.m. to 3:00 p.m. with Happy Hour from 3:00 p.m. to 6:00 p.m., allowing plenty of time for relaxation before or after a good game of golf. The community is strategically located between the Space Coast and the City of Melbourne. The nearby mall at The Avenue Viera is a diversified shopping mecca with restaurants and theater. There is always "music in the air" at The Avenue! This website is the result of a desire to keep residents up-to-date on happenings and events along with up-to-the minute concerns, such as irrigation and landscaping. Residents wanted to know what is going on in their community - NOW! Therefore, we'd like to share this site with everyone. Tuesday, April 23rd, @ 2:00 p.m. Please join us in the Residents' Clubhouse to see what's going on in your community. Everyone is welcome!